Union Health Minister JP Nadda while addressing the audience at (Brazil, Russia, India, China, South Africa) BRICS meet said that cooperation between countries for traditional medicine will strengthen the friendship amongst the nations of the group. 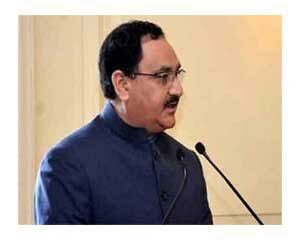 In his address, Shri Nadda stressed on the importance of building strong and resilient health systems and said that the case for strengthening health systems stems from the basic realization that even the most well-crafted or well-designed health interventions cannot succeed without a strengthened health system that encompasses improvements in healthcare service provision, utilization, quality and efficiency of healthcare services delivered including adoption of healthy behaviours and practices. The Health Minister further stated that the health sector adds direct economic value by expanding the number of jobs, investing in infrastructure projects and purchasing supplies needed for health-care delivery. Shri Nadda informed the participants that the National Health Policy, 2017 adopted by India is well aligned with the SDG-3 targets. “The new policy enunciates health in all policies, comprehensive primary healthcare, organisation of public healthcare delivery, improving vaccines and drug security and progressive movement towards universal health coverage,” Shri Nadda stated. Shri Nadda further added that the National Health Mission (NHM), one of the largest health programmes in the world, represents the prime vehicle to achieve the SDG-3, and in its next phase is aligning its goals with the National Health Policy 2017 and the SDG-3. Highlighting the achievements of India in the health sector, Shri Nadda stated that India has expanded the number of vaccines under Universal Immunisation Programme (UIP) and launched Mission Indradhanush aimed at expanding coverage by reaching the unreached. India has taken various measures to augment both number, quality and skill mix and geographical distribution to address shortage of critical health human resource such as increasing medical seats, upgradation of District Hospitals to Medical colleges in underserved areas, establishing new AIIMS, Shri Nadda elaborated. The Health Minister further informed that free dialysis services are provided free of cost to the poor under the recently launched Pradhan Mantri National Dialysis Programme which is on Public Private Partnership mode. The proposed National Health Protection Scheme (NHPS) envisages inclusion of preventive care, robust IT platform, strong grievance redressal mechanism in addition to expanding both population and benefit coverage and providing an additional coverage to senior citizens, Shri Nadda said. Shri Nadda also stated that to address the growing burden of Non-Communicable Diseases (NCDs) on account of premature mortality and morbidity, India has launched a universal population-based free screening, control and management programme for five common NCDs that is envisaged to translate into one of the largest population based screening and management programmes in the world in next few years.